The outfits women choose for traveling greatly differ from what men take with them. This regards both the quantity of clothes and styles. However, it’s not always we make wise choices and sometimes take odd outfits with us that become useless during traveling. They just take additional place in our luggage. Check out our collection of cozy travel outfits for women and choose the best outfits for your vocations from now on. We’ll help you stay comfy and fashionable at the same time. Many women prefer wearing outfits that are both feminine and comfortable. Of course, when we say feminine we usually imagine dresses and skirts as they are the typical feminine outfits forever. In fact these outfits look perfect either with high heels or ballet flats but since we are looking for an ideal match for our vocations we may consider skirts and dresses combined with comfy sneakers. This combination is feminine, fashionable, beautiful and very cozy at the same time. You can have a series of summer dresses and skirts and match them with your favorite sneakers. As for accessories, take a large summer hat with you, sunglasses, a trendy handbag full of all the essentials for traveling and some cute scarves, earrings, bracelets and watches. 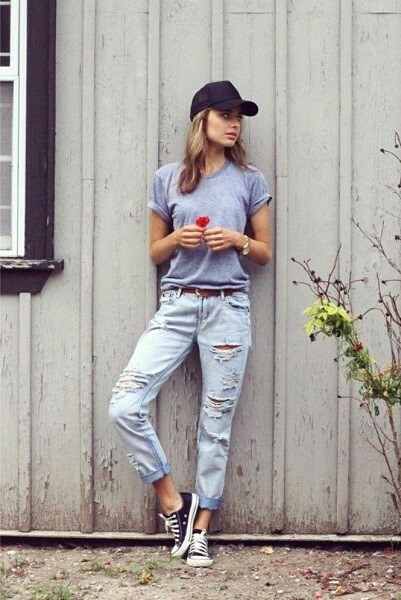 The classic idea of casual travel style is generally the combination of a cotton T-shirt or a sweater (depending on the season), a high-quality denim or any other pair of trousers made of soft fabric, a matching jacket, comfortable breathing travel shoes such as sneakers, a cap, sunglasses and a backpack. Perhaps you often use this style for traveling but let’s focus on some details to make it fresher and more stylish. So, consider wearing your T-shirt tucked into jeans with a belt. Choose cut-off frayed jeans to showcase your sneakers as well as to stay cozier. Opt for trendy backpacks or large handbags, high-quality sunglasses and a breathing cap. In spite of the fact that many consider this a kind of boyish style, it’s perfect for traveling and always makes you feel confident. Do you like light fabrics and super modern travel outfits that keep your body safe from the harsh rays of the sun or are quite suitable for rainy days? Let’s try modern jumpsuits for our next trips. They are different styles of jumpsuits for every taste, body shape and weather conditions. You can wear jumpsuits from spring to autumn with great pleasure. They look elegant and go well with a number of feminine accessories. While some like denim jumpsuits others go for cotton and other light fabrics to stay cool. The choice is up to you. Make it wisely and find the best matching of sandals or medium heels for this look. Finally, here is the most important style for you to consider for traveling. It’s the beach style. Well, in the majority of cases it’s recommended to take shorts and stylish crop tops with you if you have decided to go for a beach vocation. This combination is ideal for those who prefer wearing their swimsuits under the clothes. You just take off the shorts and the top and you are ready for the beach. Match this style with summer hats, sunglasses, beach wavy hairstyles, beach bags and sandals/ flip flops.